During the interwar period Grodno a city in the western part of Belorussia was part of Poland, however, in September 1939 it was occupied by the Soviet forces and annexed to the Soviet Union, as part of the Ribbentrop – Molotov pact. Grodno had one of the oldest and largest Jewish communities with numerous social and cultural institutions and was a well-known centre of Zionism, on the eve of the Second World War Grodno’s Jewish population was circa 25,000. On the first day of Operation Barbarossa – the German name for the invasion of the Soviet Union, the Germans reached Grodno on 22 June 1941. As soon as the Nazis entered the city, they forced all male Jews aged sixteen to sixty on forced labour, the following month eighty Jews belonging to the intelligentsia were murdered. A Gestapo office (Nebenstelle) was established in Grodno dealing with Jewish affairs, initially headed by Kriminalsekretar Gross, and he was succeeded by Heinz Errelis, from December 1941. At the end of June 1941 a Judenrat was established with a membership level of ten people, headed by David Brawer, the headmaster of a local school. As was the norm the German authorities imposed on the Jews of Grodno, all the usual restrictions, including registration, the marking of identity cards, the wearing of the Jewish badge from 30 June 1941. On 18 September 1941 the Germans transferred the administration of Grodno from Belorussia to the district of Bialystok and annexed it in March 1942 to East Prussia, under the control of Gauleiter Erich Koch. Whilst the Germans used the Jewish manpower for forced-labour from day one of its rule, the official decree was not issued until the 15 October 1941, which stated that males aged between fourteen to sixty and women aged fourteen to fifty-five were obligated to work. On 1 November 1941, the Germans ordered the establishment of two ghettos, ghetto A for skilled workers and ghetto B for non-productive Jews, and the Jews tried to maintain their pre-war ways of life, socially and culturally, and with a strong emphasis on youth movements. 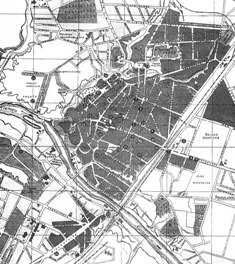 Ghetto “A” was established in the city’s historic central section, approximately 15,000 “productive” Jews were forced into this area, an area of less than half a square kilometre. 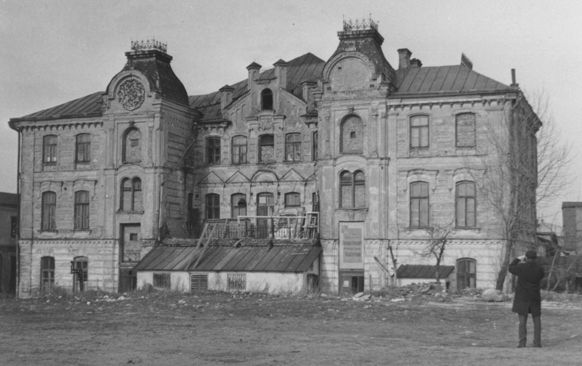 Ghetto “B” was established in the Slobodka suburb of the city, this part was more open with fewer houses, approximately 10,000 “non-productive” Jews lived here. The Judenrat worked very hard on the supply of food and to create numerous enterprises working for the interests of the German war effort, the Jews adopted the slogan “salvation through work,” clinging to the belief that through work the Germans would spare their lives. 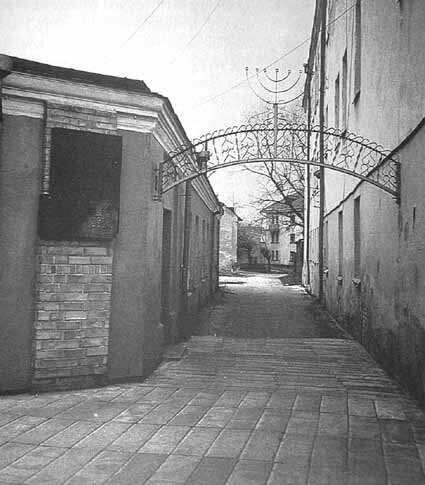 Because of its location, between Vilna and Bialystok, Grodno became a centre for the Jewish underground. It was one of the first locations to learn of the large-scale massacres at Ponary. At the beginning of 1942 an underground movement was established in the Grodno ghetto based on both Zionist and non-Zionist youth movements, the Bund and the Communists. The pioneering Zionist movements wanted to fight inside the ghetto, whereas the Communists urged fleeing from the ghetto into the forests. Mordechai Tenenbaum (Tamaroff) twice went from Bialystok to Grodno seeking to set up an underground force that would encompass the whole gamut of movements, from the Revisionist Zionists to the Communists. He succeeded in this aim, and some of the underground activists were transferred to the Bialystok ghetto, which during 1943 rose up against the occupying forces. 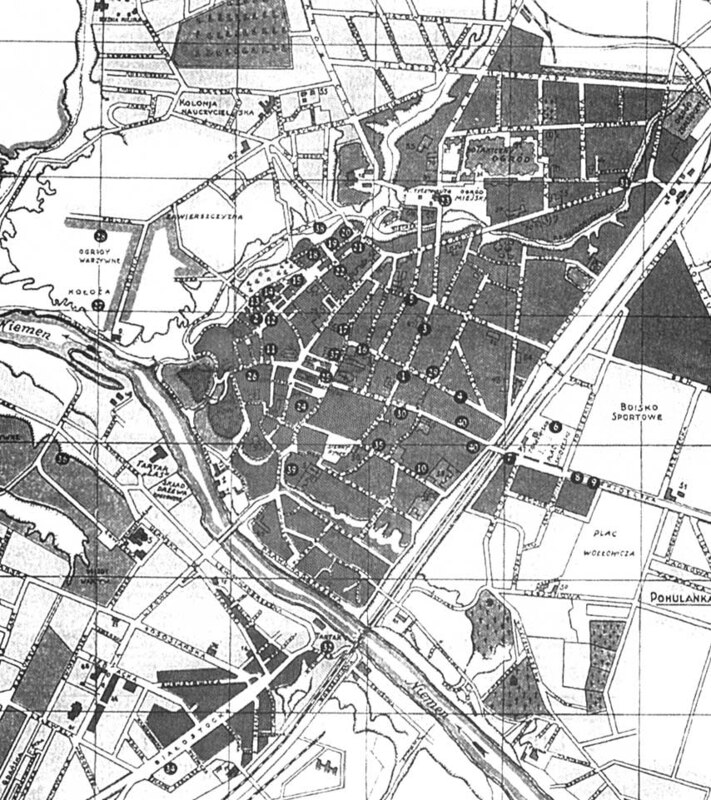 The Germans created transit camps (Sammellager) within the Bialystok district in order to concentrate the Jewish population, and facilitate their deportation to the death camps - a camp at Kielbasin was established for the Grodno area. The commandant was Karl Rinzler, who was feared for his extreme brutality. On the 2 November 1942 Ghetto A was completely sealed off. In the morning the two German commandants of the ghettos, Kurt Wiese (Ghetto A) and Otto Strebelow (Ghetto B) arrived and began shooting at the workers who were assembled at the ghetto gates. Twelve Jews were killed, forty were wounded, and in the evening the news spread that the Jews from the neighbouring towns had been transported to the Kielbasin Sammellager. The first deportation from Grodno’s Ghetto “B” took place on the 15 November 1942, to Auschwitz concentration camp. This transport of approximately 1,000 Jewish men, women and children arrived at the camp on the 18 November 1942, where 770 were gassed on arrival and only 165 men and 65 women were admitted into the camp. On the 22 November 1942 approximately 2,000 Jews were deported from Ghetto “B” to Auschwitz, this transport arrived in Auschwitz on 25 November, and after selection on the Judenrampe 305 men and 128 women were admitted to the camp, the rest were murdered in the gas chambers. Whilst this aktion was in progress Zerah Silberberg, one of the Ha-Shomer ha- Tsa’ir activists in the Bialystok underground went to Grodno to train the underground commanders and unite various youth movements. At the end of November 1942 a further transport of approximately 1,000 Jews from Grodno reached Auschwitz which saw 762 people killed in the gas chambers and only 238 men and women admitted into the camp. On 8 December 1942 another transport from Grodno reached Auschwitz, 231 men were admitted to the camp whilst the remaining 769 people were killed in the gas chambers. In the second week of December 1942, in the evening hours a transport of approximately 2,000 Jews was brought to Treblinka from the Kielbasin Sammellager near Grodno and it included Jews from Grodno itself and its surrounding area. When the transport entered the camp, most of the prisoners had already been locked in their barrack, only the “Blues” and the “Reds” along with the SS and Ukrainians, waited on the platform and in the transport yard, ready to receive the deportees. “There were still many youths there. Some of them began calling out not to listen to the Germans and not to undress. A great riot began, the Germans opened fire on the crowd. The SS men, with Kurt Franz at the head, cruelly beat the men, women, and elderly indiscriminately. We stood at the side and witnessed the scene. Germans and Ukrainians were stationed on the roofs, and they also began firing into the crowd. 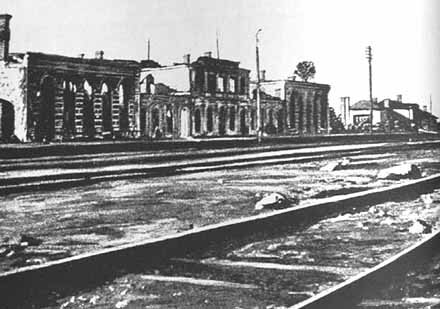 We heard an explosion – it seems that a Jew threw a grenade in the direction of the shooting and we saw how a seriously wounded Ukrainian was evacuated from the yard.” Dozens of youths who were still in the transport yard began beating the Ukrainians and Germans with their fists and, with knives they had brought with them, tried to break through the fences and escape. Other people from the transport joined them, and many dispersed throughout the various sections of the camp. Some succeeded in breaking through into the living barracks of the Jewish prisoners and sought cover. The Germans and the Ukrainians, with the help of the Kapo’s and the prisoners themselves- who were afraid to hide the resisters – removed them from the barracks and escorted them to the extermination area. The rest of the escapees were also caught throughout the camp, dozens were shot on the spot as they resisted capture, and the others were taken to the gas chambers. In the corridor at the entrance to the gas chambers, the people continued to resist and absolutely refused to enter the gas chambers. 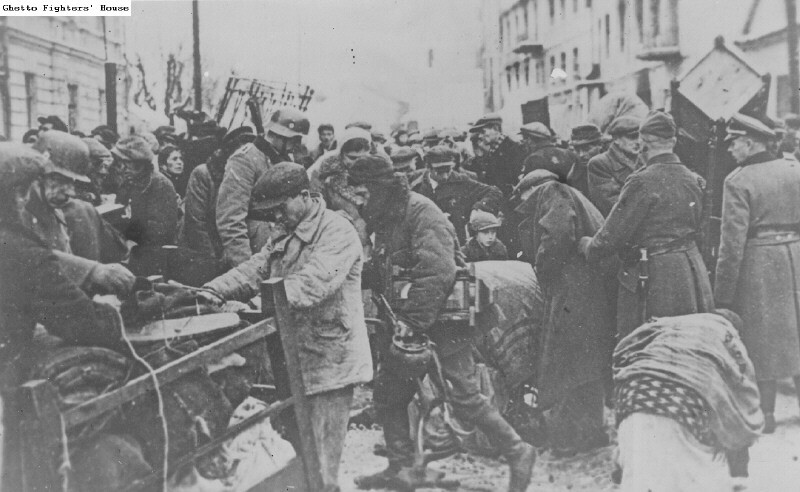 The Germans and Ukrainians shot into the corridor, many were killed, and the rest were finally forcibly pushed into the gas chambers. The Germans learned a lesson from this mass resistance incident, and subsequent transports to Treblinka were not received after dark. Then there was a brief respite in the deportations, however, on the 17 or 18 January 1943 deportation notices were issued and that evening the ghetto’s gates were sealed for five days. The manhunts began more than 10,000 people were rounded up and herded into the Great Synagogue, the deportees were marched to the train station at Lososna, whilst the elderly, the sick and the children were transported there by horse-drawn wagons and trucks. Almost daily transports rolled into Auschwitz during the later part of January 1943, with the vast majority of each individual transport being killed immediately upon arrival. 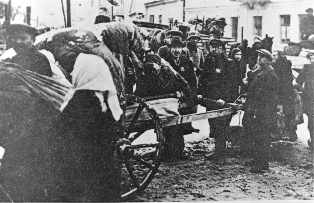 Almost 85% were murdered, out of the total of Jews deported from Grodno. Two days later a few hundred Jews were taken to work outside the ghetto, shortly after their departure, the ghetto was closed and a new Aktion commenced. Wiese, Strebelow and their henchmen appeared at the ghetto gates, where hundreds of Jews were assembled in the hope that they would be taken to work. The Germans shot into the crowd then they were made to line up and marched to the synagogue, some managed to escape, whilst others were shot in the attempt. The members of the Judenrat and its staff, led by Brawer, were also herded into the synagogue. At around dusk Brawer was called outside, where Wiese shot him after discovering that two liaison-men of the Judenrat had fled from the ghetto. A few youngsters tried to break down the doors and windows in the synagogue itself, whilst other Jews hid inside the synagogue itself. At ten o’clock at night the Aktion was terminated, and during the night the detainees were forced to march to the Lososna train station. During the forced march more Jews attempted to escape, a few dozen managed to escape, whilst some were murdered. The transport left Lososna at 05.40 and reached Treblinka death camp at ten minutes past noon. 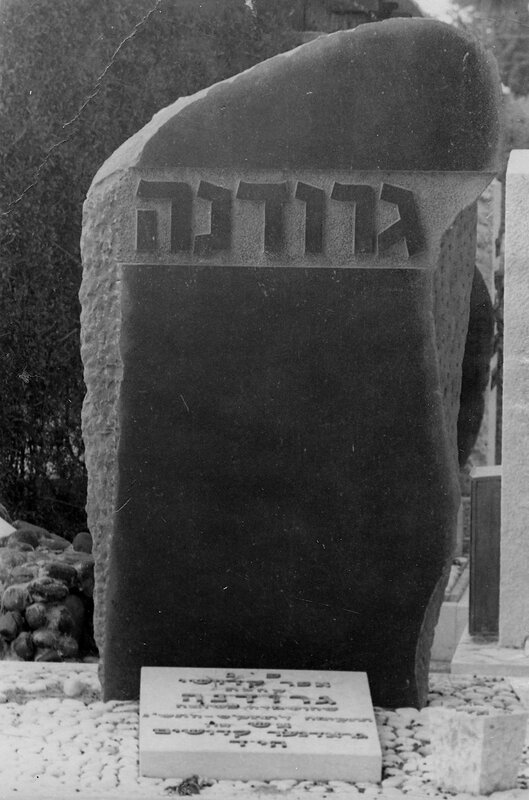 On the final day of the Aktion on 16 February 1943, Jewish policemen went through the streets announcing that anyone caught outside would be shot, but that no harm would come to those who assembled at the synagogue. The Jews did not believe these promises and not one Jew came forward, that afternoon the Germans released 200 Jews who were already massed in the synagogue and declared the Aktion terminated, Jews emerged from their hiding places only to be greeted by the sight of bodies in the streets. 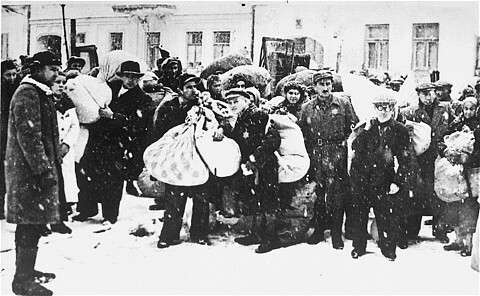 In the February deportations 4,400 were sent to Treblinka death camp in two transports, and approximately 1,000 still remained in Ghetto “A,” there were chronic food shortages. On 11 March 1943 tension in the ghetto rose, the following day the Germans ordered everyone to assemble in the synagogue, Wiese had announced the Jews were being deported to Bialystok, but this was not believed. However, the 1148 Jews were forced –marched from the synagogue to the train station and crammed into cattle cars, about 110 to each car. 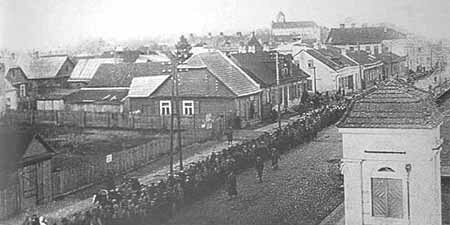 The destination in fact was Bialystok and the Jews were marched into the Bialystok ghetto. On 13 March 1943 the Germans displayed posters on the city’s streets announcing that Grodno was now free of Jews (Judenfrei). 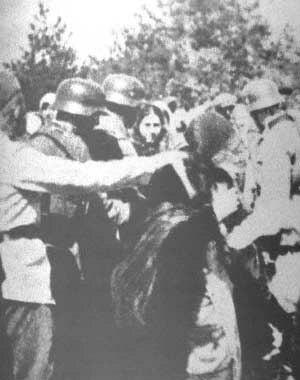 Grodno was liberated by the Red Army on 14 July 1944 only approximately two hundred Jews were still alive, including partisans and Jews who had hidden locally. After the war Wiese was convicted of murder and received seven consecutive life sentences, whilst Errelis was sentenced to serve six and a half years in prison. Encyclopedia of The Holocaust – published by Macmillan Publishing Company New York 1990.